I had a lot of jobs in a somewhat knockabout youth—waitress, clerk, temporary secretary, counter girl in a bakery (nice—no one’s ever sad in a bakery) and in a flower shop (hard—for hours I removed the thorns from the tough, gnarly roses we sold, which left my hands nicked and bloodied). All the jobs of my teens and early 20s were wonderful in the sense that I was lucky to have a job. Unskilled baby boomers were crowding into an ailing economy; they took what they could and did their best from there. I could earn a salary to buy what I needed—clothes, food, money to go to college at night, then during the day. But the jobs were most wonderful in that they contributed to the experience hoard we all keep in our heads. The best was waitressing. That’s hard work too, eight or 10 hours on your feet, but you get to know the customers. People will tell you their life stories over coffee. There’s something personal, even intimate, in serving people food, and regulars would come in at 6 or 7 a.m. and in time you’d find you were appointments in each other’s lives. At the Holiday Inn on Route 3 in New Jersey, long-haul truckers on their way to New York would stop for breakfast. They hadn’t talked to anyone in hours. I’d pour coffee and they would start to talk about anything—the boss, the family, politics. I learned from them what a TSA agent told me many years later: “Everyone’s carrying the same things.” I had asked the agent what she’d learned about people from years of opening people’s bags and seeing what was inside. She meant her answer literally: Everybody’s carrying the same change of clothes, the same toiletries. But at the moment she said it we both understood that she was speaking metaphorically too: Everyone’s carrying the same burdens, the same woes one way or another. We have more in common than we know. The hardest job I had was working the floor at a women’s clothing store on Park Avenue in Rutherford, N.J. It was part of a chain. It was boring when traffic was light—clocks go slow in retail when no one’s there. There’s no stool to sit on during your shift: You’re working the floor so that’s where they want you, walking around, folding sweaters, rearranging hangers. You don’t have the same conversations with a harried woman trying on a skirt that you do with a tired trucker on his way to the city who decides to give you his philosophy of life. One thing all these jobs had in common was something so common, so expected, that it was unremarked upon. You got holidays off. You were nonessential personnel. You worked at a place that didn’t have to be open, so it wasn’t. You got this gift, a day off, sometimes paid and sometimes not, but a break, an easement of responsibility. I suppose the shops I worked at were unthinkingly following tradition. Thanksgiving, Christmas—these are days to be with friends and family and have a feast. Maybe if you pressed them they’d say something like: “This is what we do. We’re Americans. Thanksgiving is a holiday. We’re supposed to give thanks, together.” They’d never trespass on a national day of commonality, solidarity and respect. 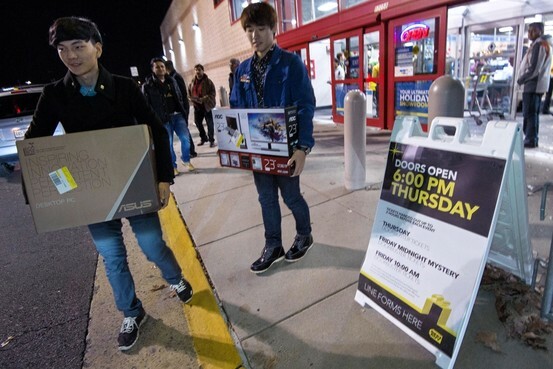 You know where we’re going, because you’ve seen the news stories about the big retailers that decided to open on Thanksgiving evening, to cram a few extra hours in before the so-called Black Friday sales. About a million Wal-Mart workers had to be in by 5 p.m. for a 6 p.m. opening, so I guess they had to eat quickly with family, then bolt. Kmart opened on Thanksgiving too, along with Target, Sears, Best Buy and Macy’s, among others. The conversation has tended to revolve around the question of whether it’s good for Americans to leave their gatherings to go buy things on Thanksgiving. In a societal sense, no—honor the day best you can and shop tomorrow. But that’s not even the question. At least shoppers were being given a choice. They could decide whether or not they wanted to leave and go somewhere else. But the workers who had to haul in to work the floor didn’t have a choice. They had been scheduled. They had jobs they want to keep. That is the sound of excellent Americans. People deserve a day off if what they do is nonessential. Selling a toy, a jacket, even a rose is nonessential. But Thanksgiving itself? It is the day the Pilgrims invented to thank God to live in such a place as this, the day Abe Lincoln formally put aside as a national time of gratitude for the sheer fact of our continuance. It’s more important than anyone’s bottom line. That’s a hopelessly corny thing to say, isn’t it? Too bad. It’s true. Oh, I hope people didn’t go. I hope when the numbers come in it was a big flop. I hope America stayed home. And happy Thanksgiving to our beloved country, the great and fabled nation that is still, this day, the hope of the world.